I am so glad you are crocheting along with me on this colorful hexy journey! Now that all our crochet hexagons and half hexagons are attached it’s time to add our granny hexagon crochet edging. 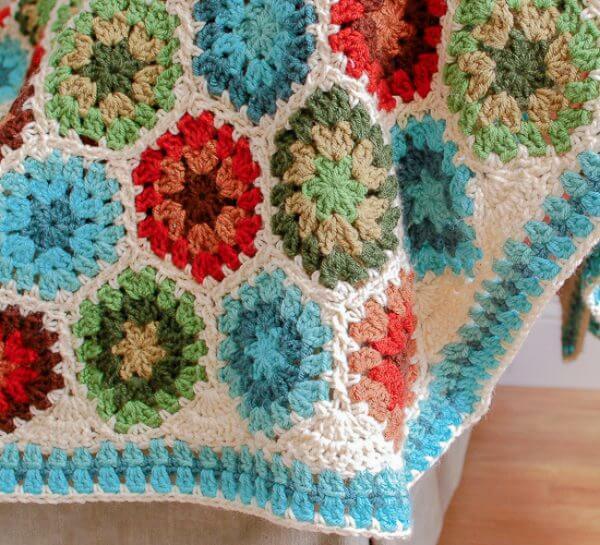 If you are just finding this now and want to create your own colorful blanket visit my hexagon crochet blanket pattern page for a complete resource on each step. I debated awhile how I wanted to finish off my blanket … did I want to keep the pointed edges of the hexagons in my edging or fill them in to make a straight edge? In the end I decided to straighten off the edges by designing this pretty granny hexagon crochet edging that fills in those granny valleys as you work around your afghan! Keep in mind that I laid out my motifs in the shape of a large hexagon afghan so I didn’t have any half-hexagons to fill in, only the V-shaped valleys. The first round we will be doing actually consists of 3 steps which will fill in the valleys where the hexagons were joined. Ch 2 and work 1 sc in next ch-2 sp along edge of opposite hexagon (counts as dc), work 1 dc in next st, 1 dc in next st, 2 dc in next st, 1 dc in next st, 2 dc in next st, Sl st in sc that was worked in the first ch-2 space of Step 1. Turn. Ch 1, drop loop from your hook and pick it up through the first ch-2 sp made in Step 1, work 1 sc in same ch-2 sp, ch 1, skip first st, *work 1 sc in next st, ch 1 and skip next st, rep from * twice more, work 1 sc in ch-2 sp that first sc of Step 2 was made, ch 1. Now repeat Steps 1 through 3 starting with 1 sc in top peak of next hexagon. Repeat across. I hope I didn’t lose you! I know it seems tricky but once you “get it” it will be a breeze and I think you will be very please with how pretty it is. 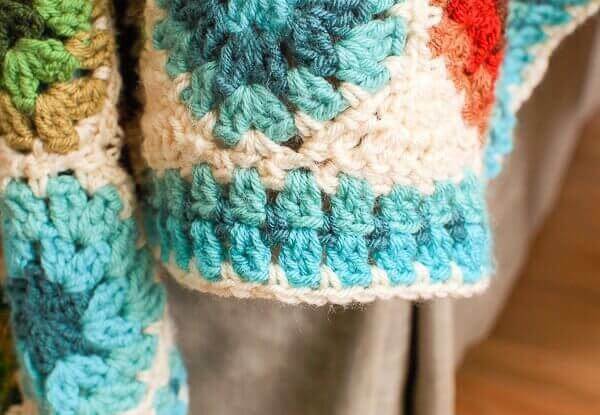 The next 4 rounds are easy peasy and can be worked on any granny blanket. Round 1: Join next color in any ch-1 sp from our “fill in” round just done. Ch 3 (counts as dc), work 1 dc in same ch-sp, work 2 dc in next ch-sp and each ch-sp around blanket, working [2 dc, ch 2, 2 dc] in each corner, join and fasten off. Round 2: Join next color between any 2 dc groupings, ch 1 (does not counts as stitch), work 1 sc between same dc grouping as join, ch 1, *work 1 sc between next 2 dc grouping, ch 1, repeat from * around, working [1 sc, ch 1, 1 sc] in each corner space, join and fasten off. Round 3: Join next color in any ch-1 sp, ch 3 (counts as dc), work 1 dc in same ch-sp, work 2 dc in next ch-sp and each ch-sp around blanket, working [2 dc, ch 2, 2 dc] in each corner, join and fasten off. Round 4: Join next color between any 2 dc groupings, ch 1 (does not counts as stitch), work 1 sc between same dc grouping as join, ch 1, *work 1 sc between next 2 dc grouping, ch 1, repeat from * around, join and fasten off. 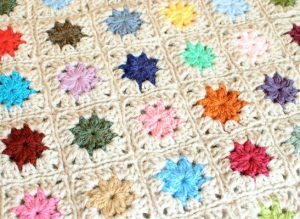 Try my Free Cluster Burst Granny Square Pattern here. So many of us are having difficulty with “filling in the valleys” on RECTANGULAR shaped afghans. Do we just tie off one side [leaving a flat corner] and re-attach yarn in a peak of the next side? I tried several times to develop a neat edge for this round and I’m hopelessly lost! Major S O S, here!!! Hi Michele 🙂 I played around and came up with a half hexagon pattern that would work well here. Keep an eye out for that post coming soon. I made a prayer shawl using hexagon grannies. Each of my hexagons have 5 rounds (2 more than yours). My prayer shawl has 38 hexagons over 4 rows (Row 1 has 11, Row 2 has 10, Row 3 has 9, and Row 4 has 8). I really like the edging you did for your blanket. Do you have any suggestions for how I can modify this for my prayer shawl? I’ll appreciate any help you can provide. Thank you. Hey…so I think I followed the pattern wrong. I think I am just now realizing that it is supposed to be a circle, but my afghan is a rectangle. How do I do the edging on it? I really love it, but I want to finish it! Hi Elizabeth 🙂 You can follow my edging pattern for the edges that have that little valley. You will have to look up a half hexagon pattern online to fill the larger spots. Hope that helps! Okay, so I am almost finished with this afghan. I am using a multi-shades of blue yarn with turquoise as the outer color (instead of white). My next task is trying to figure out how to do the edging. In the points you[‘ve included instruction for how to do it, but you did not include instruction for the other part, the part that looks like a half a hexagon. It’s not the same shape on all four sides. Can anyone help me with directions for that? Hi Linda 🙂 I didn’t use any half hexagons since I attached my hexagon motifs to form a hexagon shaped afghan as well. I would love to know how to fill the half hex spaces while doing the edging. 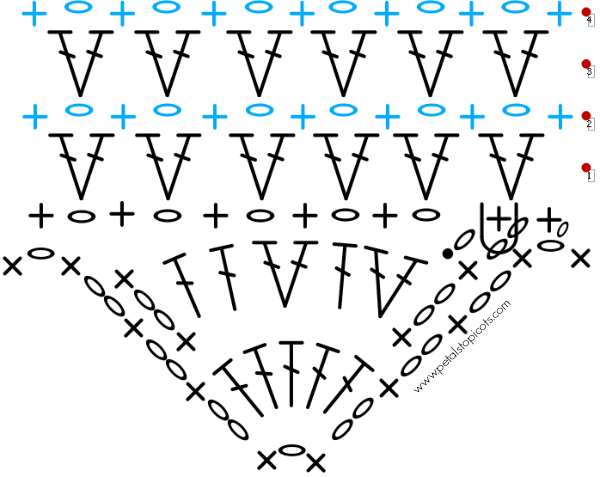 I see how to fill the v spaces but not the half hexes. thank you. I was wondering if you could tell me how much yarn for the jaygo and edging? I love this beautiful Afghan. lovely afghan! I had made a hexagon afghan and had the hardest time getting a smooth even edge – thanks for this! That looks great for the v-shaped bits. What do you do for the half-hex-shaped bits? Thanks so much for the beautiful pattern. Me gusta mucho este borde. Hi! I love your patterns! I am currently making this for my mom and was wondering how many hexagons you ended up making and how big your finished product was? Thanks! Hi Holly 🙂 Sure, I was planning on putting together a final afghan post too. I used 217 hexagons and joined them to form a big hexagon blanket that measured approximated 70 in x 70 in. Hope that helps! I’ve just completed this afghan…well kind of. I made mine into a huge rectangle using 357 hexagons. Anyway, I was fixin to start mu edging & have a big problem…I don’t know how to edge the parts that are a half hexagon instead of the triangle you have listed the directions for… How would you go about filling that part in? I was thinking of googling how to crochet a half hexagon…but figured I would try you out first. let me know please. P.S. This afghan has turned out so beautiful. I actually impressed myself! Thank you for the pattern! This link just put me back on the same page I was already on. I was asking for a pattern for a half hexagon. I think I got a bot answer. Hi Kristen 🙂 No, I am not a bot. I don’t have a half hexagon pattern. I linked to my edging which is how I filled in those valleys instead of using a half hexagon. I absolutely love how you did the edging. Now I can see this a top that I want to make. I love all things granny and this edging is beautiful. thanks so much for sharing. Thank you for your lovely patterns. I will have to try this one.